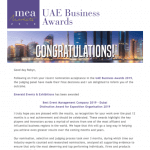 Voted The Best Event Management Company in Dubai 2019. 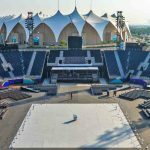 The reason for the recent success of Emerald’s event organisers and exhibitions project managers have been in the field in the UAE a very long time (most staff over a decade). Their dedication and professionalism IS our business and we recognise this in all we do. Much of our work is referrals from our valued clients and we are very proud of that dynamic. When promoting your business at an Event, Launch, Exhibition, Seminar, Conference, Gala dinner, Golf day, or Private function; We have your goals and objectives in mind throughout the whole process. With a fully operational, AV, design, build, interiors and technical activations department on hand to support, you can be assured your in very good company. Understanding the ever changing and dynamic processes of the UAE, its laws, rules, policy, traditions, and mind set can only be gauged over a successful and lengthy time serving the people and businesses of the UAE. Emerald has established relationships and contacts to support us in every facet of event life currently established in the region. We will continue to grow, nurture and develop our skills in order to stay compliant and ahead of our contemporaries in every testable way. We listen and understand thoroughly before we plan and this is the sign of the event expert, we never over promise but consistently and effectively over deliver. Our clients come to us to for the professional services but they stay with us for the personnel approach we take to all our business, we genuinely love what we do and how we do it and that transgresses into all our Events. 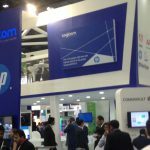 How to choose an event management company in Dubai?